The pool pump working on the coal room, yes those are heavy paint cans floating! Those words of Longfellow’s never seemed so applicable as they did this past Friday. I called David and asked him to come home early because the ceiling in our bedroom was leaking. It had been raining in sheets for a good eight hours and coupled with the previous eight days of rain I felt our roof was sagging under the burden. This turned out to be the least of our worries. Dave came home and got up on the roof in high winds and rain to find the source. He wasn’t able to so I called the handyman, who was up to his eyeballs in leaky roofs, and left a message for him to come when he could. I went downstairs to throw some laundry in the dryer and found a large puddle on the floor. 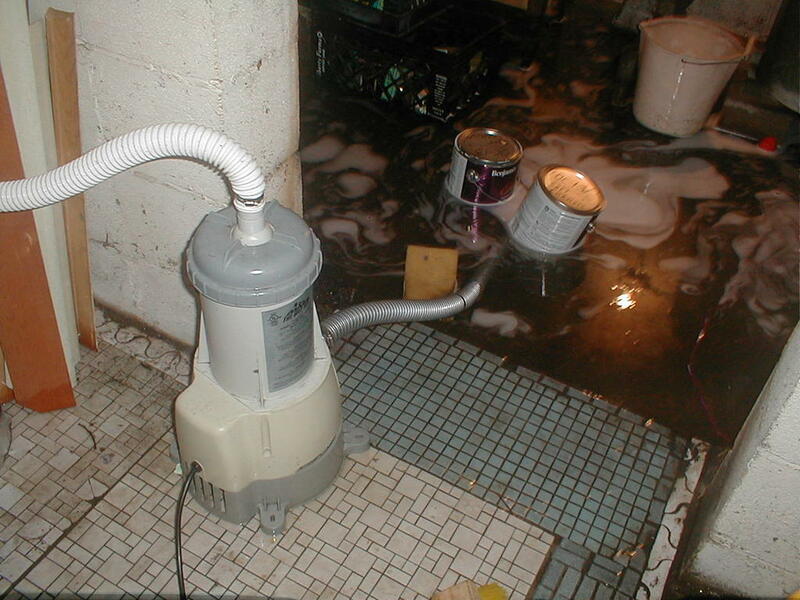 Dave got the shop-vac and as he was vacuuming up the water we discovered that the old coal room in the basement had about 12 to 14 inches of water. This was the lowest it would be for about 12 hours. Within a very short time the water began to flow in from every nook and cranny in the foundation. The kids were frantically running upstairs with armloads of books and toys. We called our friend Joe who arrived with the best work crew in town, his three oldest children. Angelica, Sara and Joe proceeded to work like dogs alongside Katie, Erin and Ryan. 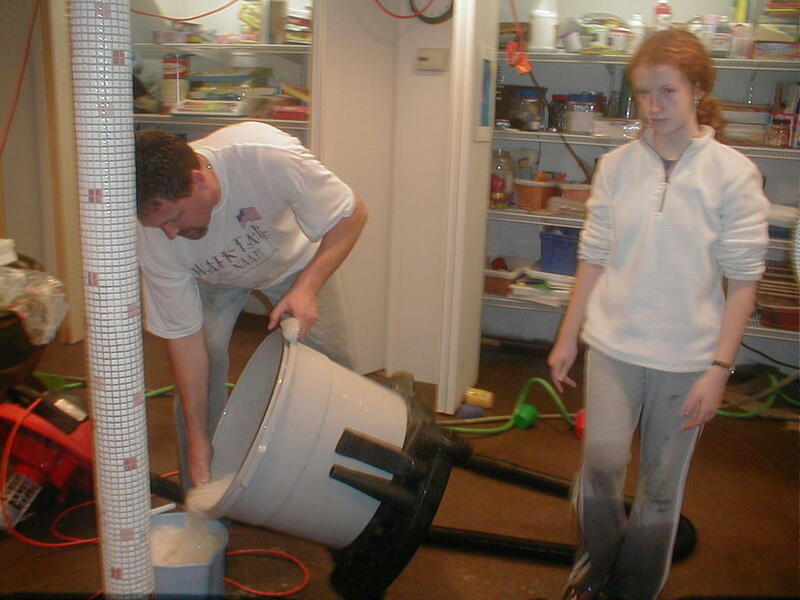 It took six kids, three adults, two sump pumps, a pool pump and a sixteen gallon shop-vac about six straight hours of bailing to keep the water at an even ankle height. At about 11:00 p.m. the rain finally ceased and our dear friends went home. They truly saved the day. Without that momumental effort we might still be under water. Some of our neighbors are not so lucky in friendship and as of this morning they are still pumping. My carpet is in tatters on the front lawn, we lost some books and quite a few puzzles. I lost a few sewing patterns and my mop gave up the fight and died. For the most part though, this was not a big deal. The basement is dry as a bone, thanks to two de-humidifiers going non-stop (I can’t imagne what the electric bill will be) and a new carpet will be installed tomorrow. We have sore shoulders and backs but nothing a little Tylenol and a glass of wine didn’t ease. We gained a great deal. The kids learned that hard work and teamwork can be fun. They learned a great lesson in loving your neighbor and the bonds of friendship. They learned that God provides what we need and turns dark hours in our life into great spotlights of warmth if we allow Him to do so. I again had the oppotunity to gain insight into Dave. He is a man who can cope with any manner of crisis. He always knows what to do, what tool to use and who to call. His ingenuity and problem solving abilities always amaze me and while I am more apt to rail against fortune his “let’s just do it” attitude keeps me focused. We gained the great gift of friends who will do anything for you. Including spending a Friday night ankle deep in dirty water hauling buckets upstairs. Throw in the homeschooling mother who thinks it is a good time for a geography quiz about state capitals and you have some kids who are going straight to heaven. The kids made the best of it, worked hard and actually seemed to have fun. Just that morning I had finished a novena to St. Theresa, the Little Flower for Ryan,. I was asking for her intercession with his reading comprehension. That morning I was praying and asking help in finding my own “little way” to become more humble and helpful. As I was scooping water from the floor into a bucket with my hands that night I got it. “OK,” I said to St. Theresa, “I get it, do each little thing for love of Jesus.” So each scoop became a pledge of love and each bucket became a sacrifice for Ryan. It was so easy then to smile and have peace about what was happening. Then I started to get silly and ask the kids questions about how we should use our new body of water. A koi pond was the best suggestion. Honestly at that point it seemed like a good idea. Well, that was Friday. By Saturday morning all the standing water was gone. Dave and I ripped wet carpet out (Note: wet carpet and padding is very, very heavy and cimbersome) and I went to the carpet store to order more. I suggested they set up some kind of frequent buyer program for me. They didn’t do that but they did give me 5% off and a quick install. Very nice people. We can skip the measuring process since they have my whole house on the computer. So here I sit among the furniture, toys and pantry items that should be neatly stored away downstairs, waiting for carpet. Trying to do school work (we can’t find some books – I have a sneaking suspicion they were deliberatley misplaced) and offering it all up. St. Theresa may be chuckling. What a mess that first picture conjures in the mind! I sure can relate.